The Schoenstatt Movement arose slowly. We often say it sprang up from life; from it came the beginnings and the different groups. The Institutes, Federations, League groups and the Movement of the people and the pilgrims, belong to the Schoenstatt Family. These groups are distinct from one another according to their level of attachment which binds them to Schoenstatt, as well as their apostolic and community commitment. The Secular Institutes are communities of consecrated life, that is, they have committed themselves to a surrender to God in the spirit of the Evangelical Counsels according to their state of life (virginal or matrimonial). They possess a marked secular character, that is, they live their ideal of surrender to God amidst the world. 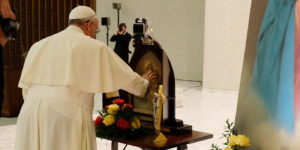 Among them are: the Secular Institute of the Schoenstatt Fathers, the Secular Institute of Diocesan Priests, the Secular Institute of the Brothers of Mary, the Secular Institute of the Sisters of Mary, the Institute of Our Lady of Schoenstatt and the Secular Institute of Families. The Apostolic Federations are communities which aspire to the highest level of sanctity in virtue of a free and magnanimous striving. They commit themselves, in relation to the apostolate, to maintain a permanent and universal apostolic spirit at the level of leaders and extends itself to all surroundings. In existence are: the Apostolic Federation of Diocesan Priests, the Apostolic Federation of Families, the Apostolic Federation of Mothers, the Apostolic Federation of Women (single), and the Apostolic Federation of Men. The Apostolic Leagues are made up of those persons who, while aspiring for sanctity, allow themselves to be educated by Schoenstatt and thus strive to fulfill an apostolic service in their surroundings. They have a diocesan character. In existence are: the Apostolic League of Families, the Apostolic League of Diocesan Priests, the Apostolic League of Permanent Deacons, the Apostolic League of Men, the Apostolic League of Women (single), the Apostolic League of Mothers, and the Campaign of the Pilgrim Mother of Schoenstatt (Schoenstatt Rosary Campaign). The Movement of the people and pilgrims is the widest foundation of the Schoenstatt Family. Belonging to this Movement are all persons who have personally attached themselves to the vital sources of Schoenstatt: the Mother Thrice Admirable of Schoenstatt, the Shrine, and Father Kentenich. They have no type of apostolic commitment, community commitment, or ascetic commitment. Lastly in existence are the Masculine and Feminine Youth branches which are organized separately. The Masculine Youth is made up of University Youth and Secondary Youth (Schoenstatt Boys’ Youth) which is divided into stages according to age and generally encompassing youths from 8 years of age to 25 years of age. The Feminine Youth is made up of University Youth, High School Youth and Elementary School Youth (“Marian Apostles”), which is divided into levels from the age of 8 to the age of 25. Organizationally, the youth branches are similar to the level of the Apostolic League although they have their own forms of apostolic, community and ascetic life. Different social activities exist (among many initiatives) which are assumed by members of the Schoenstatt Movement. Some of these are: assistance to sick persons in the hospital, family Missions and youth Missions, arts and crafts and career workshops for youths, day-care centers, Centers for children with diverse abilities, the soybean campaign, college entrance counseling, formation courses and workshops.